WAFFLES: Julie Andrews, eat your heart out. But mitts off my chicken. Dark meat or white meat, how can I decide? Crocheted with catnip all hidden inside. Chicken and turkey and drumsticks and wings. These are a few of my Secret Paw things. Pink plushy blankets all cushy and soft. Purrfect for napping in bedrooms and lofts. Premium catnip inside gives it zing. This is the BEST of my Secret Paw things! And then we don't feel so bad! This is the third year we've participated in Secret Paws and it's one of the highlights of the holiday season for us. Think of it as Secret Santa for cat bloggers. From San Francisco to New Jersey, New Zealand to Wales, cat blogging families from across the globe are paired up with another cat blogging family to make their Christmas extra special. This year our friends from the wonderful blog, Tails from the Foster Kittens, were our special Secret Paws Santa. Miss Connie and her foster kitten brood are dear friends who know us all too well. Pink for me, Orange for Waffles. Napping gear for me, poultry gear for Waffles. Our big box of presents are like a kitty's dream-come-true! 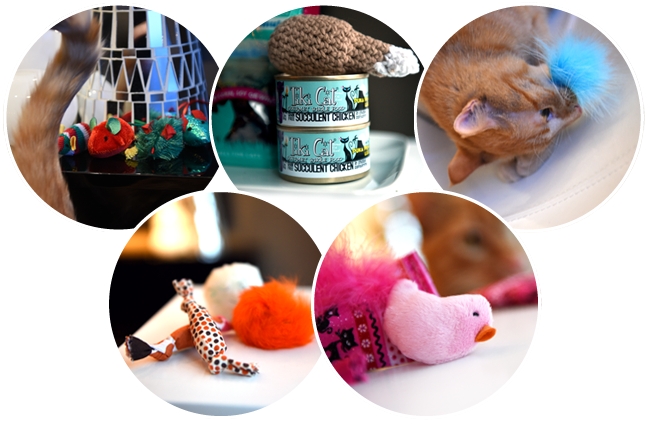 ♥︎ A chicken smorgasbord of Tiki Cat, Natural Balance treats and hand-crocheted DRUMSTICKS! ♥︎ Orange delectables for Waffles: Catnip filled fabric candy, furry and fuzzy balls. ♥︎ Pink delectables for Katie: Light up birdie, catnip filled fabric candy and mini pillows. 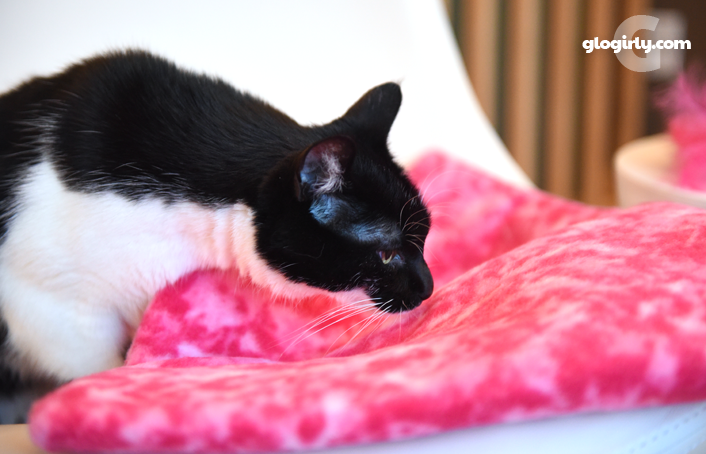 And of course, KATIE's pink plushy blanket with catnip sandwiched inside. Thank you SO much to Miss Connie and all the cats and kittens at Tails from the Foster Kittens! We love, love, love all the wonderful and thoughtful presents! Why is your person insisting upon posting lyrics to songs that my human then has to sing to me? Do you know what a horrible off key voice she has? Those are awesome gifts - but of course the TFTFK human knows what kitties love! And of course Waffles checking out Katie's presents. Paws off Waffles she will say! Get back to your drumstick! This is a wonderful idea! Love when pets gets gifts but the best part is that you make new friends. Thanks a lot! Mum only stopped singing Down Town when she went to bed last night, and now you have her started on this one. Those are great gifts you received. Now that's some pawsome Secret Paws presents! Have fun! Cool gifts--and love the chicken drumsticks on a plate! Those are very special and thoughtful gifts. Waffles' and Katie's blog posts are a few of my favorite things. That is so cool that they got chicken toys for Waffles and pink things for Katie! That was a great SP you got Waffles & Katie. Great presents for both of you. Alas, blue fuzzy wand toy, we hardly knew ye... groovy package! Those are really nice. What a great package to get. Secret Paws is a really good thing. We love giving and getting! Wonderful gifts..love your pink blanket Katie..and your drumsticks Waffles! What fantastic Secret Paws gifts!!!!! Whoa! You guys hit the jackpot! That blanket looks especially warm for a winter’s night in MN. I hope you can keep it from Waffles. Loved your song, and M was singing it outloud to me. (I had to plug my ears cuz she's really bad!) Those are pretty nice gifts you received.